The Annual Fund is an important source of funding for a range of crucial schoolwide priorities and programs. From financial aid for 75% of today’s J.D. students, to recruiting and supporting our world-class faculty; from an unmatched variety of clinical opportunities, to the campus spaces where students meet, study, and inspire each other; unrestricted gifts to the Annual Fund help to set Harvard Law School apart and maintain its place at the forefront of legal education and the future of law. Contributions to the Annual Fund are put to work right away wherever they are needed most. An Annual Fund contribution not only minimizes the impact of fiscal fluctuations on the campus community, it also provides Dean John Manning with the resources he needs to address immediate concerns and to pursue innovative new ventures and curricula. While unrestricted gifts give Dean Manning the most flexibility, allowing him to be nimble in addressing the needs of the School and preparing students to impact the world in positive ways, we also offer the option to direct your Annual Fund gift to one of three main priorities: clinical education, financial aid, and public service. Read more about how to designate your Annual Fund gift to one of our three impact areas. What Does an Unrestricted Gift to the Annual Fund Do? Today, 75% of J.D. students and 61% of LL.M. students receive financial aid from the Law School. Financial aid also encompasses summer public interest fellowships and the Low-Income Protection Plan (LIPP). With 115 full-time professors, an average of more than 150 lecturers on law, and more than 50 visiting professors on campus each year, HLS has a 12:1 student-faculty ratio. The Law School must continue to expand support for our outstanding faculty. The ability to recruit, support, and hire scholars from a variety of research fields ensures that diverse interests are represented in the curriculum. Gifts to the Annual Fund also support new faculty research. 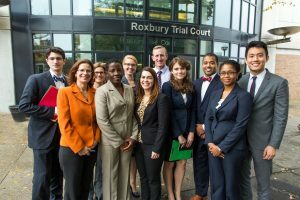 Harvard Law School offers more clinical opportunities than any other law school, including clinics focused on environmental law, veterans law, social justice, and much more. Three-quarters of students now participate in over two dozen different clinics, where they represent clients in real cases under the supervision of faculty and staff attorneys. Since 2005, HLS students have provided 4.475 million hours of pro bono legal services to people in need. To further serve communities near and far, and to respond to growing student demand for clinical education, ongoing support is needed. The Law School combines the breadth of a prolific research institution with the personal connection of the first-year section experience. The incoming class is divided into seven sections of about 80 students each. Along with fundamental law school courses, HLS offers numerous small seminars and reading groups, and more than half of our courses today have fewer than 25 students. Gifts to the Annual Fund allow faculty to pursue big ideas and explore new teaching methods.